Birthdays aren’t only for the one being celebrated. Though birthdays normally involve toasts and cute cards with heartwarming notes, and fill the one celebrating with love and gratefulness…birthdays are also for their friends, for their family, for their loved ones and the ones celebrating them. I have several summer birthdays in my life – dear friends, family members, my mother and my father’s birthdays among them. As I think of a gift, or write a note in a card, as I drive miles to visit an old face, their birthday is for me too. It allows time to reflect, to appreciate and to be grateful for what they have brought to my life. As I flipped through old photos, looking for ones that were just terrible enough to embarrass my best friend, I was overcome with nostalgia and taken back to moments that have defined both of our lives. The time at Disney. The time with the traffic cone. The time we skipped school and went to the beach. Visits to colleges. Meeting new friends. The time we threw a surprise party and barely took any pictures. Our first time at a club. Our first time getting hurt or scared and seeking the other’s support or advice or comforting words. The time I showed up at her door in the middle of the night to bake a cake. Birthdays celebrate unique individuals…they make them feel valued; but birthdays allow me to reflect in awe at my luck. In awe at the amazing people I have in my life and how I couldn’t imagine what I would do without them. 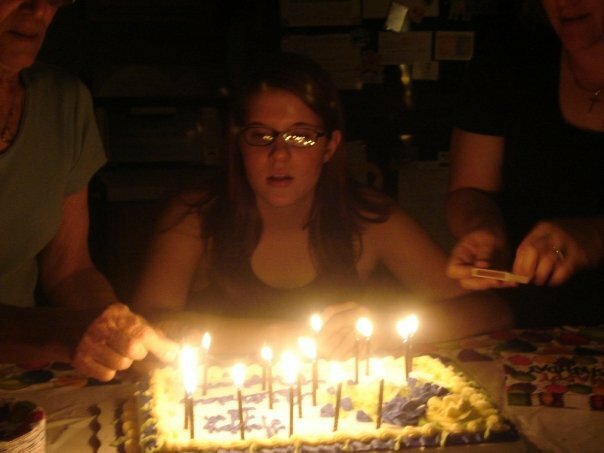 While looking through old photographs, I stumbled across one of my own eighteenth birthday. The photo is blurred by the haze from the candles on the cake and two bodies are barely visible in either corner, cut off by the angle of the photograph. The picture wouldn’t mean much to a stranger, but it means a thousand words to me. The two people on either side of me in the photo are my mother and my grandmother. The two most important people to me. That moment of them leaning in, lighting the candles, and standing by my side is forever ingrained in my memory. Across from me stood my closest friends, singing and smiling and laughing for me, and my pillars of strength stood by my side. I felt so loved and blessed on that day, but it’s because of the people by my side, the people who have always been by my side, and they are the ones worth celebrating me. Selfishly, my loved ones’ birthdays remind me of who I have been blessed to have as a part of my life and that is why I celebrate them.